Greetings Allison and fellow NosillaCastaways. Allister here from New Zealand with a quick review of a product that won’t excite many, but will help prevent moments of horror. The problem to be solved is keeping my gorgeous gold 12″ MacBook looking gorgeous. I bought the laptop while travelling and so quickly became aware of just how easily it marked even carefully putting it in its own pocket in my work-provided laptop backpack. It clearly needed its own special protection. 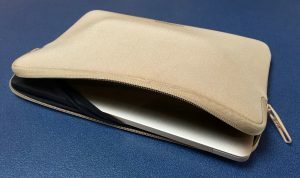 I asked on the NosillaCast Google Plus community for recommendations and Bart suggested the Acme Made Skinny Sleeve for MacBook which I very much liked the look of. But one of the disadvantages of living in New Zealand is having to deal with shipping. If I can’t find a local source for a product, it’s often not worth the hassle, as if something is wrong with the product when it arrives, I am usually stung for return shipping and the value for money diminishes quickly. I couldn’t find the Skinny Sleeve locally. So I set about looking for something similar at local suppliers where I could walk in and inspect the product. It turns out there is very little on offer here. I walked into our local Apple reseller and looked around and could not find a single one. I asked a staff member and he couldn’t find any either. Maybe they don’t sell many MacBooks but I though it was a pretty poor showing to have NO products available. As with so many things in life, the solution presented itself when I wasn’t looking for it. I had gone into a major appliance retailer (who also happens to be an Apple reseller) to buy printer inks and while heading to the counter noticed a large rack of cases and sleeves, predominant amongst which were products for iPads. 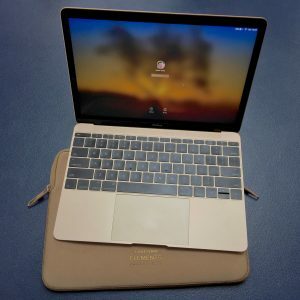 But there in the corner was a selection of larger ones and after hunting through many 13″ and 15″ sizes I found the Tucano Elements Second Skin for MacBook 12″. The Second Skin for MacBook is available in four colours – black, grey, blue, and gold. I was rather taken by the gold one which matches my MacBook’s colour quite closely. It’s more saturated than the tinted aluminium of the MacBook but is tonally very close. While finding a link for this review, I noted a wonderful thing Tucano do on their web site. 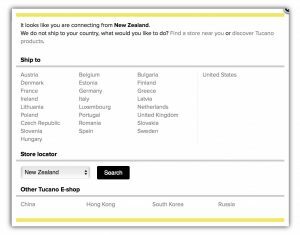 I got a pop-up saying they do not ship to New Zealand and this gave me the option to search for retailers who stock their products. I checked it out and sure enough the very place I bought it is on the map. Top points, Tucano! The sleeve is made of 4mm neoprene, smooth to the touch on the outside and soft and velvety on the inside. It is robustly constructed with four rows of flatlock stitching on the main seam and a high quality zipper which glides easily every time and has two pullers for convenience. Inside the sleeve, adjacent to the zipper there is a small elastic net which comfortably stretches over the edge of the MacBook when inserted, like the flap inside a pillowcase. This serves to stop the MacBook from slipping out when the zipper is opened. I thought it might also ensure the inside of the zipper could not mark the laptop but I note there is a soft piping where the zipper is attached to the neoprene and this serves as a buffer between laptop and zipper as well. When the MacBook is inside the sleeve I notice that it slips around a little which I don’t like, but when sliding the MacBook into the sleeve there is not much room for error in alignment so it is probably just right. Weighing in at a mere 150g, the sleeve does not detract from the ultra-portability of the 920g MacBook. The outside of the sleeve is adorned with only a product name which is “embossed” on the neoprene in what appears to be a soft plastic, and a similarly embossed logo on the other side. These are in a darker tone of the same colour which makes them easily visible but not striking. in fact, between the neoprene, zipper fabric, zipper plastic, stitching thread and embossing, the colour matching is excellent. The inside is completely black with a stamped logo in white. While I think I would prefer the elastic band of the Acme Made product over a zipper, I otherwise cannot fault the Tucano. My MacBook now lives in this sleeve 100% of the time it is not being used and I pop it in my work backpack every day along with my Lenovo. The only concession to absolute trust in the sleeve to protect my MacBook is I fact to protect the sleeve. I make sure to place the flat topside of the Lenovo laptop against the sleeve as the knobbly underside tends to dent the neoprene. I don’t think that denting would be permanent, but I like my sleeve to look as pristine as my MacBook! The Tucano Elements Second Skin for MacBook 12″ is €24.90 from the manufacturer, if they ship to your country. I paid NZD$49.99 for mine and I’ve seen it for USD$34.99 on Amazon. Links are in the show notes. If you’d like to hear more from me, you can find most things over at zkarj.me including the once-again-relaunched Sitting Duck Podcast.